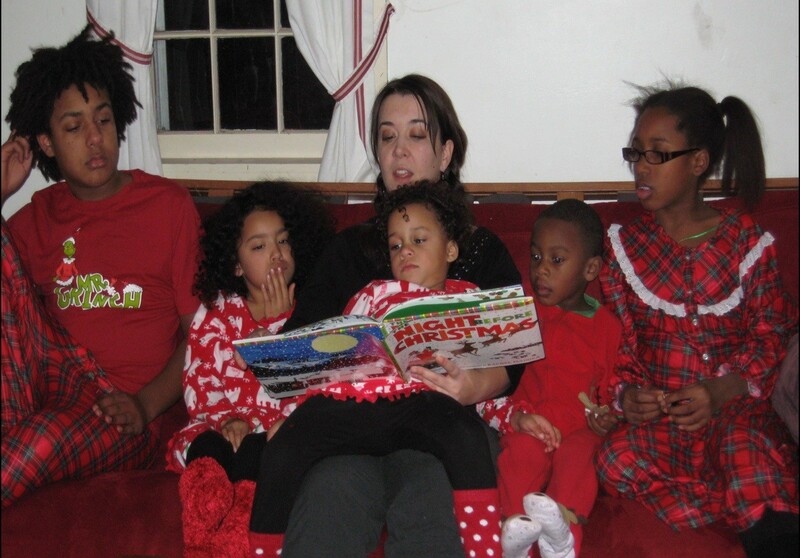 The author reading Rachel Isadora’s The Night Before Christmas with five of her children. Photo provided by the author. My husband and I are both lapsed Catholics, and we celebrate Christmas in our multiracial, adoptive, blended family with an emphasis on togetherness, giving gifts, and taking joy in traditions. Although I’ve left the Church I grew up in, I still feel a deep connection to many of its stories, and the Nativity story, in particular. I’m compelled by the vision of the birth of a child as an occasion for wonder, hope, celebration, and reverence. I’m grateful for the equation of the humble with the holy. I’m moved by the depiction of Joseph, embracing his role in Mary’s life and in the life of her child, despite initial doubts and misgivings when he learns about her pregnancy. I think of my grandmother’s devotion to the Madonna because, as she said, “she was a mother, too,” and I regard Mary as a symbol of motherhood that has sustained generations of women in my family and beyond. 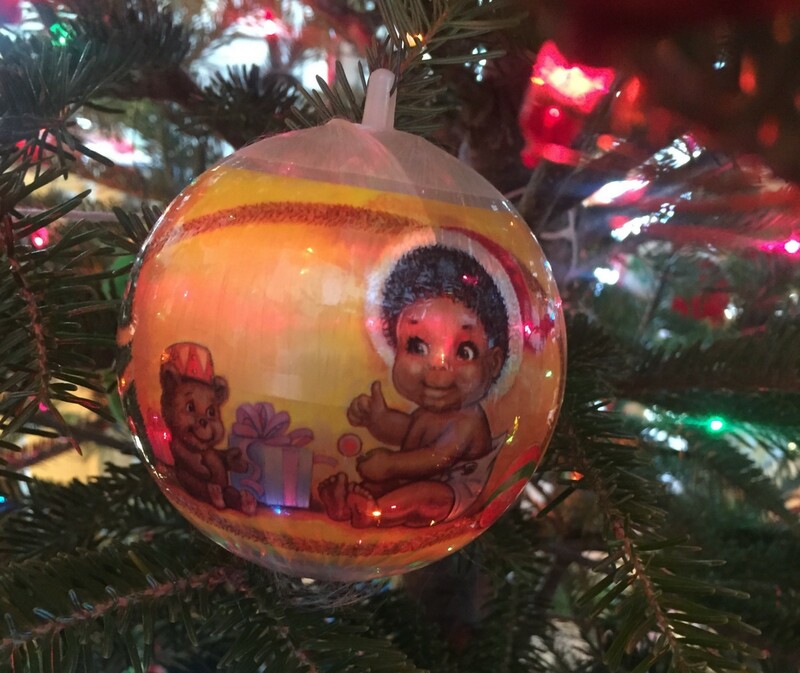 An ornament given to the author’s son for his first Christmas in 1997 from her mother’s friend. As I read over the mimeographed sheet of lyrics, I noted that my teacher had crossed out the bolded line in the fourth verse and replaced it with a new line, handwritten in her own words, for us to learn. I asked her why she had done so. “I think the original lyrics are racist,” she said plainly. To my recollection, we didn’t have a long conversation about race. But our brief exchange had a profound impact on me as she, a White woman, modeled resistance to texts that, intentionally or not, reinforce White supremacy. 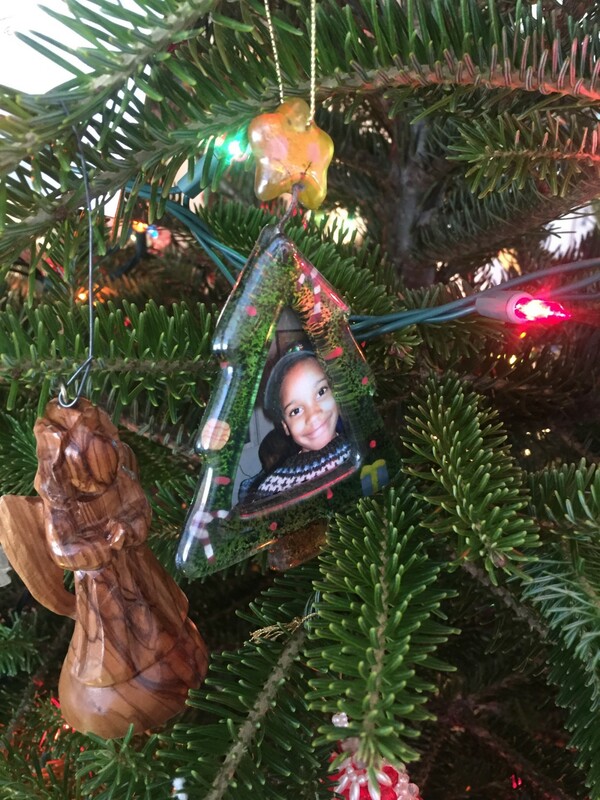 An ornament on the author’s Christmas tree with a photo of her son on his adoption day in 2007. I cannot remember the words Madame Parker taught us to sing in place of this line. And I am, of course, paraphrasing this conversation that happened over thirty years ago; but in doing so, I’m faithfully reporting what I took away from that brief exchange. I do remember that she used the word “racist.” I remember that I objected and said it “just says what he looked like.” In doing so, I was taking for granted as truth the representations of the Nativity I’d seen in books, in my church, and in the scene on my grandmother’s credenza with its one Black wise man among the other human and angelic figurines who all looked pretty darn White and rosy-cheeked. I was referencing what I knew, or, put more thoughtfully, what I’d been taught, implicitly or explicitly through artistic and other representations of Jesus and the story of his birth. In that third grade French class, Madame Parker challenged me to rethink what I knew and to reexamine what I took for granted. Although she was clearly intentional in crossing out the “blanc,…[et] rose!/white,…[and] rosy!” line from the song and replacing it with another, I don’t know if she anticipated that anyone would ask her about this decision. To my recollection, we didn’t have a long conversation about race. But our brief exchange had a profound impact on me as she, a White woman, modeled resistance to texts that, intentionally or not, reinforce White supremacy. It was a lesson I could apply to the Nativity story and to all kinds of texts, and it was a way of thinking that set my mind ablaze with possibility. I couldn’t describe it like this yet, but in that class I was learning not just the French language, but how to regard all language as something that both constructs and is constructed by culture. Within that recognition was an invitation to interrogate the texts I read as products and producers of particular worldviews. [W]e don’t really know what they looked like. So why not imagine these figures in ways that reflect and celebrate the diversity of humanity? That invitation is a gift I want to give my children, too, when I share diverse representations of the Nativity story with them. 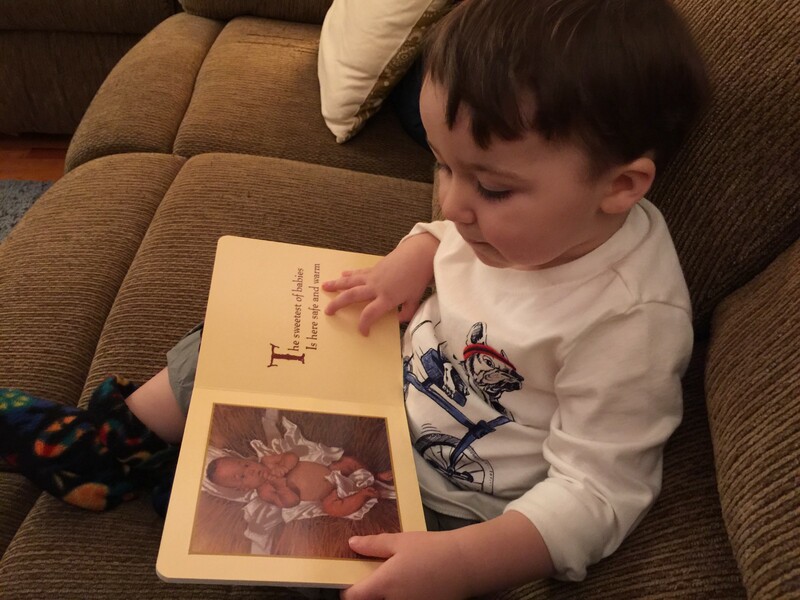 I recently read Margaret Wise Brown’s A Child Is Born with illustrations by Floyd Cooper with my 22-month old son, Jesse, who is White. It was his first introduction to the Nativity story, a fact I noted to myself as he pointed to the Black baby in the manger and said “baby Jesus happy day-day” (his phrase for happy birthday) after I told him that Christmas celebrates the birthday of this baby named Jesus. Other Nativity books on our shelves include depictions of White people in their illustrations (among them is Julie Vivas’s marvelous, feminist, The Nativity, which I write about here at The Horn Book) and so Jesse, like his Black, Latina, and biracial siblings before him, will grow up with diverse representations of the people in this biblical story. My aim isn’t to confuse my children, but to teach them, as Madame Parker taught me in third grade, that we don’t really know what they looked like. So why not imagine these figures in ways that reflect and celebrate the diversity of humanity? The corollary of depicting them only as “white,…[and] rosy!” troubles me, not only as dishonest, ahistorical representation, but as an equation of what and whom Christianity regards as holy with Whiteness. Conferred through these diverse representations of the sacred and the secular is the gift my teacher gave to me, when in a French lesson about a Christmas carol she invited me and my classmates to engage critically with texts and to resist White supremacy. An ornament on the author’s Christmas tree with a photo of her daughter on her siblings’ adoption day in 2007, hanging beside a Santa ornament made by the author’s great-grandmother. I extend this commitment to providing my children with diverse representations into secular Christmas stories, too. Christmas books with Black Santas, along with others that represent him as White, are also on our shelves, as are stories about White people, Native people, and people of color celebrating Christmas in contemporary and historical contexts. My children’s individual handmade stockings include knit pictures of a gingerbread man, a snowman, and a reindeer, and also a White Santa, a Black Santa, and a Black angel. Our tree is decorated with ornaments holding photos of our multiracial family members over the years, and it’s also festooned with ornaments featuring a multiracial cast of Santas, angels, elves, and toys. Conferred through these diverse representations of the sacred and the secular is the gift my teacher gave to me, when in a French lesson about a Christmas carol she invited me and my classmates to engage critically with texts and to resist White supremacy. As the recent backlash against the Mall of America’s first Black Santa reveals, some still harbor hateful resistance to anything but a White Christmas. 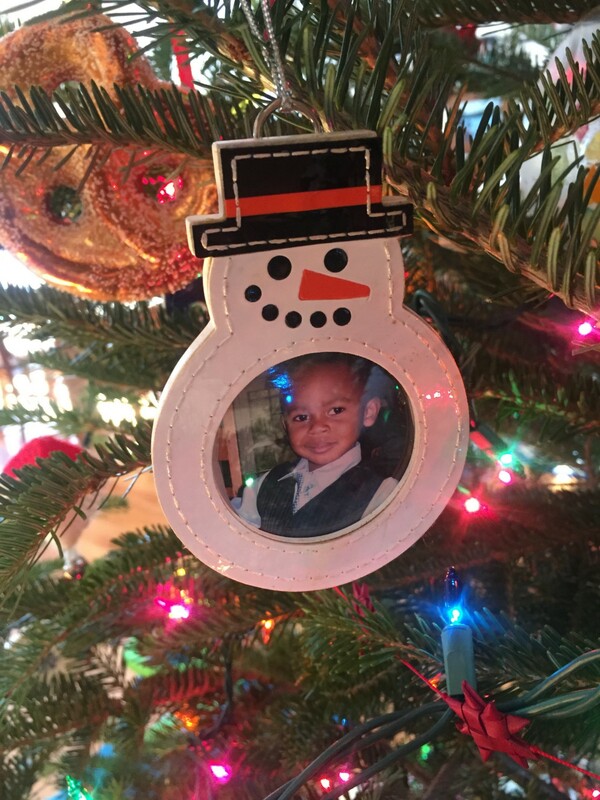 But, although I’d love to find even more, it’s much easier to find diverse Christmas books, ornaments, and decorations now than it was when I became a mother to my first child, a biracial son, in 1997. This helps my children to regard Christmas as a holiday that belongs to all of them, each and every one. 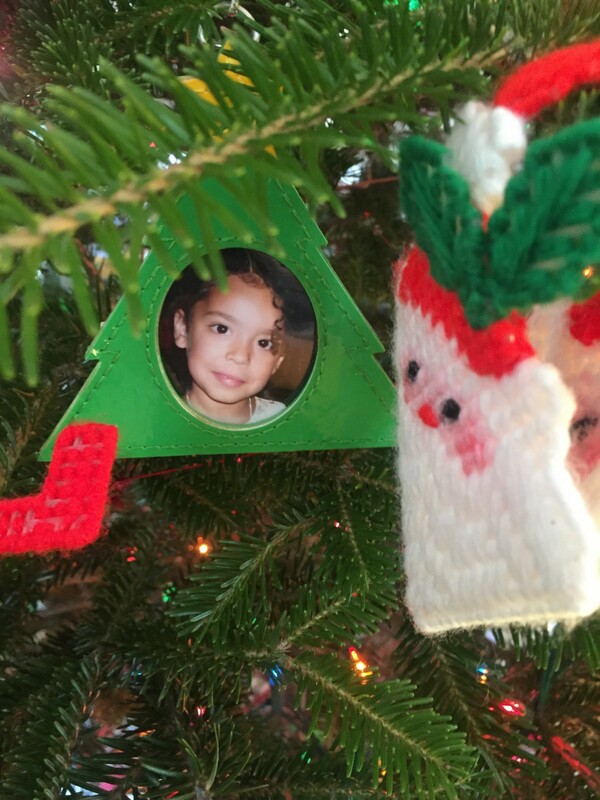 An ornament on the author’s Christmas tree with a photo of her daughter taken the month she came home to their family in 2006. EmbraceRace is a multiracial community of people supporting each other to help nurture kids who are thoughtful and informed about race. Like EmbraceRace on Facebook; sign up for our bimonthly newsletter. Megan writes about kids' books & writes them too. She teaches Children's Literature at Simmons College and is a mother of 7 in a multiracial, blended family.